Green Living Show | Mmm, Tasty! Rich and I checked out the Green Living Show on Saturday, thanks to two free tickets from Ecochick. We missed the show last year and had been looking forward to checking out all the green products this year. There were lots of vendors showing off non-food items like home decor and appliances, clothing, cars and bikes, and building supplies, but hey, this is a food blog, so I’m going to talk about the food! Tons of great food vendors were on hand to display their products and answer questions from the huge crowd. While the show was pretty busy on Saturday afternoon when we arrived, the food sections definitely had the biggest crowds! 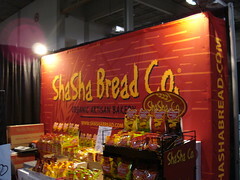 Lots of local and semi-local organic and natural food vendors were at the show, with a huge variety of products to try – baked goods, chips, chocolate, soy and rice milk, dairy-free ice cream, sauces and more. We tend to shop at stores that have a lot of these products, so we already knew about most of the companies that were in attendance. Some of our favourites include Sweets from the Earth (love the biscotti), Natur-a (their maple soy ice cream is really good), Shasha (ginger snaps! ), Neil Brothers (chips and salsa, plus products from a lot of other companies they distribute here in Ontario), Taste of Nature (granola bars) and Yoso (soy yogurt and soy cream cheese). This year’s show also had a Fresh Farm Fare section, where local farmers and local chefs were paired together to create amazing food. Tickets were just 2 dollars each, or a pack of 5 for 10 dollars. Most dishes were 1 ticket, although some of the meat stuff was 2, but as vegetarians Rich and I didn’t try those. What we did try, however, was fantastic. 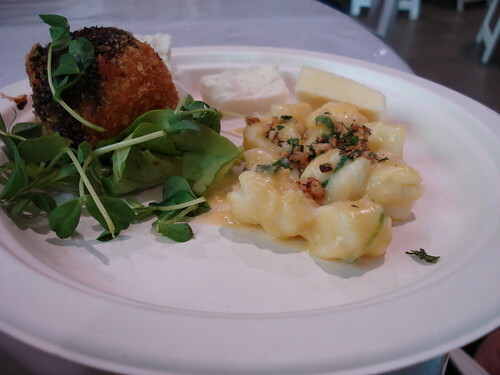 In the photo below we’ve got Sovereign Farms Early Spring Ontario Greenhouse Panko’d Tomato Goat Cheese Salad, Cottage Cheese Gnocchi with Wild Leeks and Preserved Lemon, and a selection of three Ontario cheeses: feta, goat cheese, and a sharp cheddar. Ok, so we went for a lot of cheese, what can I say? All three were really lovely, and probably would have cost 10 bucks each if we’d ordered them at a local restaurant, so 2 bucks each was a bargain. My favourite was the goat cheese salad. After stuffing our faces with food, we decided to check out the Grapes and Hops Tasting Pavilion. Tickets here were also 2 dollars each or 5 for 10 dollars. We assumed that for that price, we’d be getting a little tasting pour of wine or beer, so opted to buy 5 tickets, but soon discovered that most places gave very generous pours for 2 bucks, as you can see from the photos below. 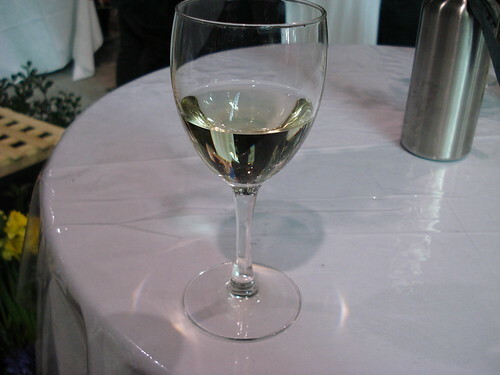 First we tried a Riesling from Inniskillin. It was really lovely, dry and crisp. We’ll probably pick up a bottle or two of this over the summer, as it was the perfect wine for a hot summer day. Next we decided to get two different rosé wines and compare them. On the right is Ladybug rosé from Malivoire. 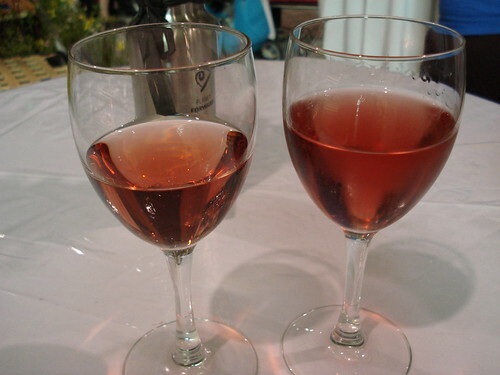 On the left is Canada’s first biodynamic wine, a Cabernet rosé from Southbrook Vineyards. Both were nice, but we preferred the Cabernet rosé from Malivoire, finding it a bit better rounded and less ‘young’ tasting. I didn’t get a shot of the beer we sampled, but it was Cameron’s Auburn Ale. It wasn’t anything amazing but it was a nice, drinkable beer, a bit on the sweet side, and with a bolder hoppy taste than we were expecting. A good beer for parties, we figure, since it’s something many will like. After sampling all that food, beer and wine, we were pretty stuffed, so figured it was time to head out. Overall it was a fun show, and a great place for foodies to get samples and learn about new organic products coming out. We’ll be back next year!